The summer provided a breather from the swine flu outbreaks of last spring, but now that fall is here, world health organizations are braced for a pandemic. How can you protect yourself and your family – and what should you do if you get sick? 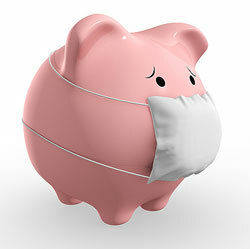 Swine flu vaccine is expected to be available starting in early to mid-October. The CDC recommends that priority be given to immunizing pregnant women, people who live with or care for children younger than 6 months of age, health care and emergency medical services personnel, people between the ages of 6 months and 24, and people age 24 to 64 who have chronic health or immune system problems. Healthy people age 65 or over are considered least susceptible to the virus, and the CDC suggests that the other groups be immunized first. However, the CDC does not expect a shortage of vaccine. Regular seasonal flu vaccines are available, and the CDC recommends both vaccines for most people, especially for young people, older people, people with chronic illness, people who care for children or the elderly, or people who are in close contact with large numbers of people -- in other words, just about everyone. Wash your hands regularly, with antibacterial soap and warm water, for at least 15 to 20 seconds. If you can’t get to soap and water, use alcohol-based antibacterial hand gel. This simple action can significantly cut your chances of getting the flu. Cover your nose and mouth with a tissue when you sneeze, and throw the tissue into the trash. Young children can be taught to sneeze into their elbows, if they don’t have a tissue. Avoid touching your eyes, nose or mouth, because you can spread germs into your body in this way. The symptoms of swine flu are like the symptoms of other strains of influenza: fever, body aches, runny or stuffy nose, sore throat, nausea, or vomiting or diarrhea. If you develop these symptoms, the CDC says, you should stay home until your fever has been gone for at least 24 hours, without fever-reducing medication. If your symptoms are severe, contact your doctor about possible treatments, including prescription anti-viral medications.